Concertainer Bastions are formed similar to concertainer gabions but are factory lined internally with a non woven geotextile membrane to the perimeter mesh panels of the unit, allowing for the use of suitably selected granular fills to ensure compaction of the materials without settlement. These units are modular in section and fold in a concertina fashion for ease of transportation and erection on site. They are available in a variety of different sizes and lengths to suit the application. Please feel free to contact a member of our sales team on Belfast +44 (0) 2890 454599 Ashbourne +353 (01) 8027173 or click the button below to send your enquiry via email. 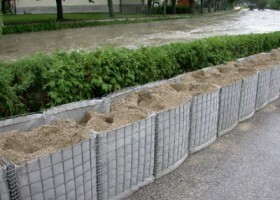 Bastions can be used as temporary structures on civil engineering construction sites or as rapid deployment flood protection barriers in place of sandbags in certain circumstances. When used for temporary works they should be properly engineered as gravity retaining walls. For temporary retaining structures a suitable drainage fill should be incorporated through the structure at regular intervals along the wall length to prevent build up of hydrostatic pressure. Bastions are not free draining like stone filled gabion structures. For flood defence purposes bastions should be sand filled. It is also common practice for the front face to be additionally externally lined with an impermeable liner.